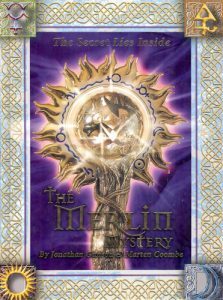 The Merlin Mystery by Jonathan Gunson and Marten Coombe is an intriguing but insanely difficult puzzle. Despite a 3 year time limit for solving it, and an international joint effort, nobody succeeded in claiming the reward. An official solution was published shortly after the closing date but wasn’t very clearly written. Worse it immediately gives away the final solution rather than leading people through the puzzle step by step. This spoils it in my view. I have written my own solution which I think explains it better and goes through the puzzle in a more reasonable sequence. The solution fills a baker’s dozen of posts and I will be issuing one part each week. Hopefully, this will give readers a chance to test out their own puzzling skills and maybe solve the rest of it for themselves as pieces of the solution are revealed. To follow the solution, you’ll need your own copy of the Merlin Mystery (MM). I am deliberately not including many scans of the original book in order to avoid copyright infringement. Copies can usually be picked up quite cheaply on Amazon.